Microsoft Game Studios corporate vice president Phil Spencer also claims Games With Gold will feel "more true" to what he thinks it should be with the "constraints that are there" in the future. While Microsoft's "Games With Gold" is similar to Sony's PlayStation Plus in that they both offer two "free" games each month, Microsoft's iteration has been chided since it usually offered games a couple of years old compared to Sony's more current slate of games available in its premium service. 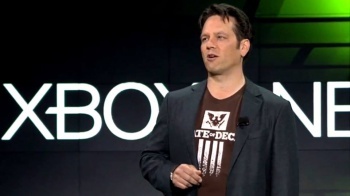 Speaking during a Q&A session following his SXSW panel, Microsoft Game Studios corporate vice president Phil Spencer states that Games With Gold is "fundamentally different" from PS+ since you get to keep the game even if your subscription expires. While the exec isn't in charge of the Xbox's Games With Gold program, he reveals he's been working with the team on a more regular basis following its launch and has been playing a more active role in picking the games that appear in the initiative. Spencer also adds it will be "more true" to what he thinks it should be with "the constraints that are there." That said, I have been sitting down, monthly now, with that team - some of the earlier months were already programmed - and playing a more active role in picking franchises that show up in Games with Gold, and I think you'll see at least something that feels, at least, more true to what I think Games with Gold should look like with the constraints that are there. For reference, Games With Gold's offerings for March are Sid Meier's Civilization Revolution and Dungeon Defenders, while PlayStation Plus has Tomb Raider, Thomas Was Alone and Lone Survivor: Director's Cut for PS3, Unit 13 and Monster Hunter: Freedom Unite on the PS Vita, and Dead Nation: Apocalypse Edition for the PS4. To date, Games With Gold is still not available for the Xbox One -- a fact that I hope gets remedied soon. Which platform do you prefer? Games With Gold where you keep the games even if your membership lapses, or PS+ that offers newer games but necessitates that you remain a member to play them?